The 3D printer manufacturer German RepRap announces its 3DPrintBox. Every 3D-printer with a USB interface can now be connected to a network (Ethernet and WLAN) and then be managed via a web browser. The integrated storage device in the 3DPrintBox also allows printing of models without any direct computer connection. On top of that, a webcam can also be integrated allowing users to remotely check the print status. Being able to print a model without hooking up a computer or laptop to the 3D-printer as well as remotely monitoring the print status is high on the wish list of printer administrators and private users alike. Using the 3DPrintBox by German RepRap 3D-printers can now be integrated in a network via Ethernet or WLAN. The 3DPrintBox acts as a print server, allowing Gcode files to be printed from any network-attached computer, and so replaces the usual dedicated computer. The 3DPrintBox browser interface allows OS-independent access, so even mobile phones and tablets can be used to control the printer. And by attaching the optional webcam to the 3DPrintBox commercial users and those printing larger models will benefit from a real-time display as the print progresses, all through the browser interface. 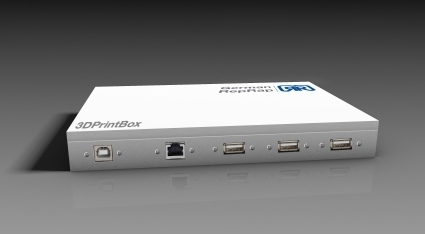 The 3DPrintBox can control a 3D-printer and is available for 149 Euro (incl. 19% VAT). It is compatible with the German RepRap 3D-printers X400, PRotos as well as NEO along with any 3D-printer with a USB connection. German RepRap will offer the development to the OpenSource Community.